I snuck in early to snap some pictures so you’ll know what to expect tomorrow, when Skin Fair opens! 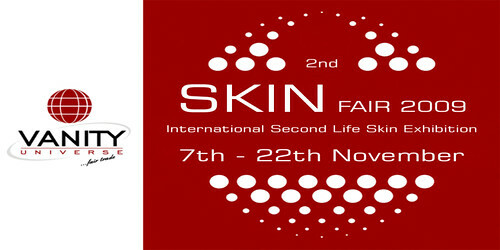 My first impression is that this skin fair is extremely well organized, the layout is GREAT. Shops are arranged in a square, you can easily walk from one level to another and not miss any shops along the way. Read more about it at the Vanity Universe Skin Fair 2009 website. The skinfair sim must be right next to the wild coast naturalist resort – because when people were getting booted yesterday from their attempts to log into the resort guess where they were landing? How appropriate. I don’t know why LAQ never take part of events like this.